I keep waiting to come across a Dave Burgess Consulting, Inc book that I don’t like… one that doesn’t inspire me as much as others. I honestly keep thinking as I begin every “new” book (one I’ve not read yet), Will this be the one? The one that I have to make a tough decision if I blog truthfully or if I sugarcoat my interest level. I know I sound like a broken record because I have literally said to purchase every single one of these books. Book 47 continues the tradition of excellence, and even raises the bar a bit. Jay Billy is a Pirate through and through. It is evident in his tweets and his passion is even more impressive through this book. He was given a mighty task. One that I actually thought no one could achieve… be the first Lead Like A Pirate guide book released by DBC, Inc. Pave the way for future guide books related to the content in the Teach Like A Pirate leadership equivalent. That is pressure. Real pressure. Lead with Culture is the perfect way to kick off a series of guide books. His energy, enthusiasm, passion… it can’t help but to create a positive culture. I imagine that rainbows erupt from the sky every morning to await arrival of students and teachers at his school. Unicorns prance in the fields nearby allowing students to run their fingers through their mane while staring into their souls. Fairies flutter by with pixie dust to sprinkle good cheer on everyone. Students move from class to class on puffy clouds of inspiration. Okay, so maybe not that surreal, but pretty dang close. Jay leads us on a deep-dive of what really matters in our schools. He speaks to culture, joy, kindness, intention, honesty, passion, and more. Not only does he outline why it matters, but he shares how to improve those areas in your own school through examples of things he does in his school. This is why the implementation plan is so difficult here. I could pick something from every doggone chapter to implement and then sit back and watch what happens. One of the things I love most is that Jay makes you feel as though you can be successful in changing the culture of any school. And it doesn’t have to come at the expense of accountability scores. Dave Burgess tweets this about those false dichotomies (having either this OR that). The school I serve is fantastic. I love that we are working every day to shatter the “traditional” educational model. Our ELA teachers are taking students to the Science Institute to make stories come to life, history teachers are allowing students to experience Ancient Egypt through virtual reality escape rooms, math teachers encourage students to apply concepts of linear, quadratic, and exponential functions to build roller coasters in Minecraft (then ride them in virtual reality, experiencing them to scale), and science teachers weave hands-on labs with context clues to decipher content vocabulary. All the while, encore classes like art, chorus, band, physical education and health, Project Lead the Way 1 and 2, and computer science discoveries are incorporating content from core subject areas and giving students opportunities to explore passions and connect the arts to all they do. It’s an amazing, inspiring place to work. Culture has improved by leaps and bounds in the past two years. Our administration has created a culture of yes and she encourages us to think out of the box. She sets high expectations and supports us as we strive to reach those high expectations. If a teacher has a need, she moves things around to make it happen. We still have a long way to go. As in many schools, when the loudest voice is negative, it overshadows all of the awesome that is going on. Sometimes, our loudest voices can be negative. We’re working to shift that and change the conversation. I want to seek out the positive voices this year, even if they are quiet as mice. As I read Jay’s book, I was overwhelmed with ideas and had no idea how to incorporate them all. Because they are ALL worth bringing into #DBC50Summer implementation! My favorite part of this book is the space for reflection after each chapter. Jay gives us three action items that correlate to the topic he just covered. These are the Leadership Treasure Hunt (Find This), Navigating the Seas (Think about This), and Charting the Course (Take Action). So to incorporate as much of Jay’s wisdom as I possibly can, I am going on a treasure hunt! I can just substitute treasure hunt for bear hunt, and I’ve got my implementation plan! Each of the Leadership Treasure Hunt items from Lead with Culture will be found through the 2018-2019 school year and recorded! Once I find these treasures, in true Lead Like A Pirate fashion, I will drop an Anchor of Appreciation as applicable. Here’s my BINGO card to keep me accountable for appreciating and implementing something from each chapter. Lead with Culture by Jay Billy is another must-have from the DBC, Inc collection! Jay’s YouTube channel can be found here. You can find more information on his book here. 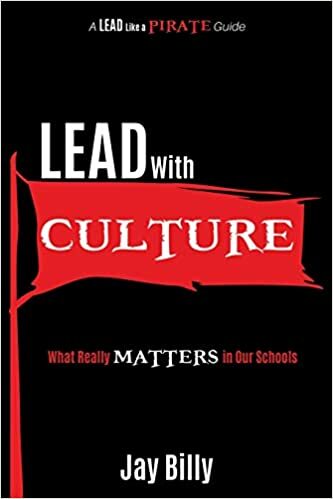 Jay is active on Twitter and you can follow the community using the hashtag #CultureMatters and #LeadLAP. Jay is featured on multiple podcasts. Check them out with a quick Google search. Some great options are PodcastPD, Aspire, and DisruptEDtv. Join the #LeadLAP chat on Saturday mornings at 7:30 am PST/10:30 am EST by using the #LeadLAP hashtag! It’s a terrific community and Jay is a regular there! Definitely add your thoughts to the flipgrid! This space was created by the incredible Andrea Paulakovich as a global collaboration effort on all DBC, Inc books! I’m just fortunate enough to co-pilot the space! Also, you’re going to want to see Andrea’s in-depth #DBC50Summer post on Lead with Culture! She is so impressive! Check it out here! Be sure to get a copy of the book so you can spread the awesome that Jay offers through bettering your own school culture! Even if it’s an amazing space to work and you have your own field of unicorns and puffy clouds and fairies with pixie dust, Jay reminds us that “greatness is a moving target” – keep improving & strengthening that culture! THREE MORE BOOKS TO GO! Three more days to do it in! I sure do hope I can do this! My biggest problem is that my blogs are posted incredibly late at night because that’s my quiet time. Everyone’s asleep and I’m able to think more clearly. I will have to interrupt this pattern in order to finish by 9:54 pm EST, which is the official beginning of Autumn! Book 48 is by an author we know and love for Kids Deserve It and Stories from Webb! Todd Nesloney is back and this time we get to meet Travis Crowder; these two educators co-authored Sparks in the Dark! This will kick my brain into high gear for literacy and encouraging a life-long love of reading and learning! I’m excited to get to it!